I’ve had a hard time introducing velvet into my wardrobe. Even though I love how other girls are constantly pulling it off, it just never feels quite right on me. This bustier, for me, is the perfect amount of velvet to test out the trend in a way that works for me. 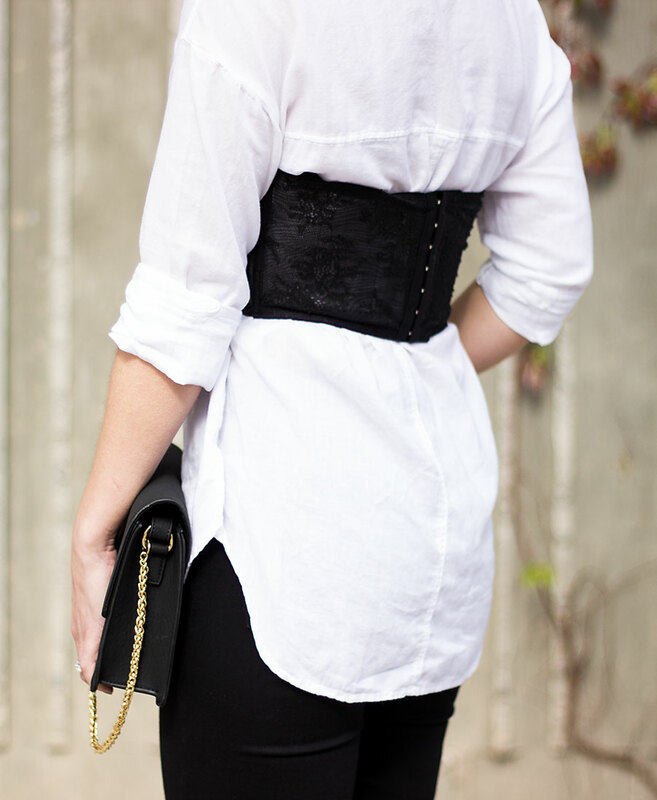 It’s simple, elegant and adds the perfect amount of interest to my basic white button up. Noooow, do I think it’s going to be a piece I pull out on the regular, absolutely not, but I do like that I have the option to add a little velvet when necessary. Brand and I are headed up to Flagstaff for the night today. It snowed all week and while it’s not supposed to snow while we are there it is supposed to be in the 20’s today! We plan on going sledding and enjoying what will be for us, the last bit of winter. What are you girls up to this weekend? Anything exciting? Whatever you do I hope it a good one! those sunglasses are perfection! Shannon, I love this look so much. I could never ever pull this off but it looks amazing on you. Happy weekend, my friend. Have fun in the cooler temps. That is such a fun, chic addition to the look! I'm definitely a fan of velvet in small doses like this. Totally obsessed with this! It seems bustiers and corsets are making a huge comeback. Nailed it.